The administration of President Donald Trump released its priorities for higher education reform on March 18. Among about a dozen points, the outline proposes simplifying the options for Americans to set their student loan repayments as a percentage of their income. If they do so, undergraduates could get their loans forgiven sooner. It also proposes expanding Pell Grants student aid to certain short-term non-degree-bearing courses. 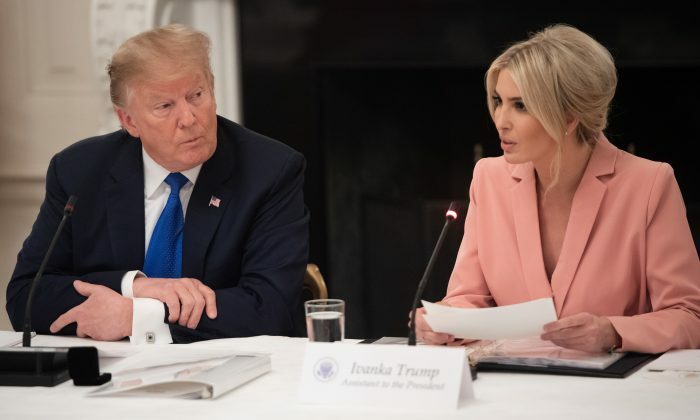 The proposal (pdf) was released by the National Council for the American Worker, a cross-department body formed in July to “reshape our education and job-training landscape so that it better meets the needs of American students, workers, and businesses.” The council is headed by Ivanka Trump, the president’s daughter and senior adviser. The federal government currently offers four income-based repayment plans ranging from less than 10 percent up to 20 percent of the borrower’s discretionary income. Whatever is left after 20 to 25 years is forgiven. About 7 million borrowers are using the plans. Trump proposes one plan that would take 12.5 percent of the discretionary income and would forgive anything left after 15 years for undergraduate students. Under the new plan, some people would pay more every month, but the undergraduates would be eligible for forgiveness sooner. Americans owe nearly $1.5 trillion in student debt, up over 350 percent since 2003. Nearly 30 percent eventually default on their loans, according to the left-leaning Brookings Institution (pdf). Other parts of the proposal aim to make higher education more aligned with career opportunities. It calls on Congress to expand Pell Grant eligibility to include “high-quality, short-term programs that provide students with a credential, certification, or license in a high-demand field.” Currently, only courses leading to a degree and some certification courses are eligible for the grants. The Trump administration is the first in decades to focus heavily on the benefits of blue-collar jobs, many of which offer a solid wage, yet require less than degree-bearing post-secondary schooling. While the traditional four-year college route has been pushed by several previous administrations as the path du jour to career success, the growth in employer demand for degrees appears to have been overstated. In 1992, 37 percent of jobs required at least an associate college degree, while in 2020, that number was projected to reach 47 percent, according to a 2014 Georgetown Center study (pdf). However, less than 28 percent of jobs actually required a college degree at entry level, based on May 2016 data by the Bureau of Labor Statistics. The American economy had 7.6 million job openings in January with more than 6.2 million unemployed Americans looking for jobs, not to mention the nearly 5.2 million who’d like a job but haven’t sought one out recently. The proposal also calls on colleges to help students limit their borrowing and for Congress to limit the PLUS loans used by graduate students and parents of students. These loans are currently only limited by the costs of college attendance. The administration is open to discussing how high the limits should be, an administration official told reporters in a March 18 teleconference. Senate Education Committee Chairman Lamar Alexander (R-Tenn.) voiced support for the administration’s goals in a March 18 statement. “I share the Administration’s goals to make a college education worth it and to make it simpler to apply for federal student aid and pay back student loans. It is helpful to have these suggestions as I work with Senator Patty Murray, the senior Democrat on the education committee, to develop bipartisan recommendations so that we can report legislation to the full Senate before summer,” Alexander said. Rep. Bobby Scott (D-Va.), chair of the House Education and Labor Committee, didn’t provide a comment on the proposal. Correction: A previous version of this article incorrectly stated that a spokesperson of Rep. Bobby Scott promised to provide a comment by March 19. The Epoch Times regrets the error. The majority of our colleges and universities have steadily been transformed from institutions that foster open debate into incubators of cultural Marxism.